With Harald Finnvik, Consul General for Norway in Baku, who doubles as Resident Manager for Statoil. Your situation here at the Norwegian Consulate is quite unique among the Embassies. You're both Consul General for Norway and Resident Manager of Statoil, "wearing two hats"-one as diplomat, the other as businessman. How do you find this combination works? When I arrived on the scene in Baku in June 1995, the Consulate had already been set up by my predecessor. Back in September 1994 the Norwegian delegation arrived in Baku to take part in the signing of the "Contract of the Century" since Statoil was a partner in this project. It was then that the Azerbaijani government challenged us to set up diplomatic representation here. Now Norway is a small country. Many consider us rich. But the truth is that we're small, and there are limits as to what we can afford. The Norwegian government felt that to establish an Embassy here might be a bit premature. That's when they asked Statoil if their representative could also take on the responsibilities of the Consulate. Of course, we agreed. 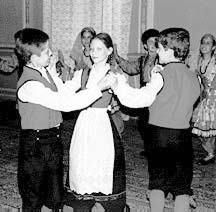 Left: Azerbaijani children, wearing Norwegian traditional costumes, performing Norwegian dances on the occasion of Norwegian Constitution Day, May 17, 1996 in Baku at the Nizami Museum. Actually, this arrangement is not unique to Azerbaijan. It's a tradition with us. In the past, we used to be quite spread out all over the world because we have a large merchant fleet. We needed official governmental contacts in numerous harbors so we created consulates and used Norwegian companies to man them. What do you do here as Consul General? First of all, I act on behalf of the Norwegian Ambassador Svein Saether who sits in Ankara. I'm really just a local hand. I get involved if anybody loses his passport but mostly I act as an emissary between Azerbaijan's Ministry of Foreign Affairs and the Norwegian authorities. This gives me the possibility, of course, to expand our business network-a chance I personally would never have had if I were acting only as a Statoil representative. Combining two jobs is challenging but it's also inspiring and I like it. We've also established an Azerbaijan-Norway Friendship Society and have invited senior people in the Azerbaijani government to be honorary members. So with a few resources we are able to promote the Norwegian industry in Azerbaijan in a very efficient way. Photo: Raising the Norwegian Flag at the Consulate which also serves as the Norway House which provides administrative infrastructure for Norwegian companies getting started. In the "Old Inner City" of Baku. So generally, you find that the two jobs complement one another? There are really only about 20 Norwegians here. Most of us are in the oil business. So there isn't so much work at the Consulate. In our Embassy in Turkey, it's quite busy as there are hundreds of Norwegians and thousands of tourists, and the office has to deal with people losing their passports and money. Actually, the Consulate takes less than 5% of my time. My busiest period was when we were preparing for President Heydar Aliyev's official visit to Norway earlier this year. It was an important event. Norwegians became so much more aware of Azerbaijan. Not many people there know much about Azerbaijan so this trip acted as a catalyst to introduce Norwegian industry to the potential here. I think the Norwegian people are beginning to understand how important Azerbaijan can be. On the other hand, it was good for President Aliyev to see our country, too. Our Prime Minister holds great respect for him, and I think he felt this support from the Norwegian government. We showed him Statoil's operations in Stavenger. President Aliyev always delights in seeing Thor Heyerdahl (See AI 3:2, 60; Spring 1995. "The Azerbaijan Connection: Challenging Euro-Centric Theories of Migration") and so we managed to arrange for Heyerdahl, now 81, to come to Norway and give the President a personal tour through the Kon Tiki Museum. It was a unique occasion. Twice Heyerdahl has been to Azerbaijan to study the petroglyphs of the reed boats in the ancient cave of Gobustan, located about an hour's journey east of Baku. He's hoping to be back in 1997 since he is part of the Azerbaijan-Norway Friendship Society. So the visit provided the impetus for further relations. I think Norway can be something of a model for how Azerbaijan can develop. There are so many similarities between our countries. We're both small. Our histories have both been shaped by the oil industry. I think seeing how the Norwegian economy has benefited from the revenues from the oil industry-the way it is controlled, the way it is run, the way the money benefits the people-could be valuable for Azerbaijan. Actually, quite a few government officials have already visited Norway to study this. Of course, Norway should not be viewed as the only model for Azerbaijan, there are many others. It doesn't mean that since we've been successful, Azerbaijan should copy our model. They'll have to discover what's best for them. Let's focus a bit on your business role. What are some of Statoil's newest developments in Azerbaijan? Well, I'm the only one actually representing the Statoil office at present, but we have 12 people who are working with AIOC [Azerbaijan International Operating Company]. Now that we've recently signed a production-sharing agreement for the development of Shah Deniz, I'm expecting at least five additional people to arrive here in the coming months, and depending upon the progress we make in 1997, more will be assigned here. We're now involved with asset management in Statoil which means that we're moving away from headquarters and trying to place our organizations closer to where the actual work is going on and where the decisions really should be made. It means we spend more time doing things and less time reporting about them. We are involved with SOCAR with some technological transfer regarding Subsea installations. Statoil probably has the greatest number of Subsea installations of any company. It's clearly the wave of the future. In new fields in the North Sea, we're getting away from huge concrete structures which are so costly. Now, we're organizing floating production ships down to a number of Subsea wells that are spread around the sea bottom. This is the trend. So now we're doing some joint Subsea studies with SOCAR, starting with Oil Rocks. Subsea installations were really intended for deeper waters, but SOCAR would really like to study them in territory that they're already very familiar with. What's happening these days with the Norway House that you're setting up to facilitate Norwegian companies here? Last year at the 1995 Caspian Oil & Gas Show, a few of us were talking about how difficult it is to get started here unless you had a contract in hand. The little guy has a hard time competing with the big guy. A lot of companies were reluctant to make the plunge because it's so hard. Just the everyday routine tasks are difficult to manage if you're on your own. You really need some sort of facility-a place to work, a telephone number, a fax number. You need a driver who can take you to meet the right people. You need a highly qualified interpreter. All this administrative support is immensely important when you're in the middle of negotiations. Sure, you can do all this from your hotel room or apartment but there are a lot of hurdles. What do you do when you need something as simple as a letter to be typed or a document copied, for example? That's when we got the idea that if the Norwegian companies which wanted representation here would pool their resources, we could split the costs and share the infrastructure. In Norway, the State Petroleum Industry has recently made drastic reductions to their general costs, by cutting back by 50 percent. They're doing that so they can be competitive in the future. We knew that if we didn't reduce our costs, investment capital would go elsewhere in the world, and if it didn't come to the North Sea, we would all be out of business. Pulling back 50 percent is an incredible amount. It meant that we had to rethink and restructure everything. In Baku, one way to support this effort has been to create the Norway House. So we're here. And quite a few Norwegian companies are beginning to take an interest in the Caspian Sea. They're beginning to come. We see our facility as an initial stepping stone-to get them started. I expect there will be a continuous flow of new companies as the ones who have been here longer start signing contracts. Of course, a few companies will disappear, but most of them, we hope, will be able to carry on and eventually move into their own offices and set up their own administrative infrastructure. What about your own path to Azerbaijan? What is your own background? Actually, I've been in the oil business for only the last 15 years. Prior to that I was in computers-programming and sales. Then at 33, I went back and studied Economics, returning to the University for three years. I have a Masters in Business Administration, finishing the School of Economics and Business Administration in Bergen. I joined Statoil afterwards. I've lived in the US, Germany and Azerbaijan but have been involved with many international projects at Statoil in Norway. I like being in Azerbaijan very much. I find it exciting to be working in a country that's so new-that's just opening up. Despite the language barrier, Azerbaijanis are very open and very easy to communicate with. Did that surprise you that Azerbaijanis were so receptive? Yes. I didn't have any idea it would be this way. Actually, I didn't know anything about Azerbaijan before I arrived. Most of the things that I've learned have surprised me. Azerbaijanis are seeking ways to find their roots. They're proud of their past, and they're trying to create a new identity as a young independent nation. In my relations, I haven't really noticed that they have what I would call "the Soviet Stamp" on them. Personally, I feel as secure here as I do in Norway, and I'm convinced there's a great future for Azerbaijan. When I first thought about coming here, I had a different attitude. I thought I would just put in my time, a maximum of three years, and when it was over, I'd take my paycheck and go back home. Now I'm not even thinking about returning. Why should I go back? I'll never have a job like this one. I love the place, I love the people and I love the job. Of course, Norway is always in my heart, and it's inevitable that someday I will return, but I don't even give it a thought right now. From Azerbaijan International (4.3) Autumn 1996.